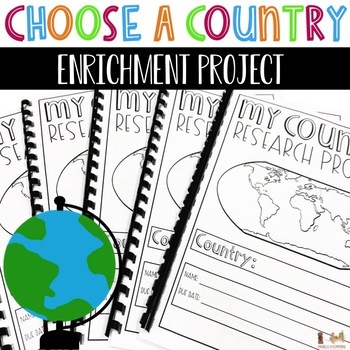 Your students will stay engaged with this ANY country research project. Students will choose a country that is of interest and become an expert! This project begins with defining terms and ends with a presentation! Students will work through activities that require different levels of thinking. Students are required to do a bit more critical thinking as the progress through the activities. 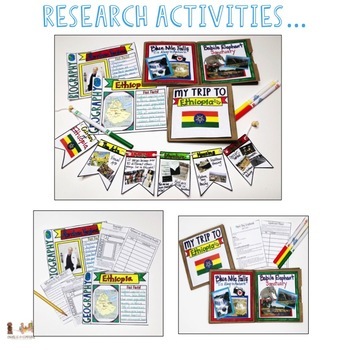 There are 3 "during research" projects that are perfect to display in the classroom or in the hallway! Project Cover Page: I like to bind the pages together to make a book for students. You could also staple the pages together. A Country Comparison - Students will compare information about the country they are researching to the United States. Paper Bag Scrapbook - Students will pretend they went on a trip to the country they are researching. They will highlight significant places in their scrapbook. 2 paper bags will be needed for each student. 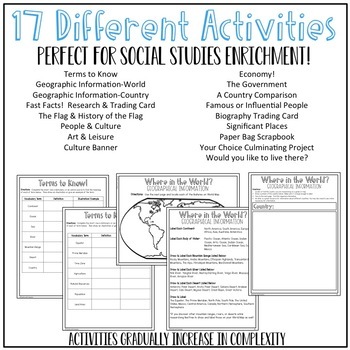 Your Choice - Students will choose an activity to complete. This activity will require students to use the information from their research. Writing Activity - Would you like to live there? 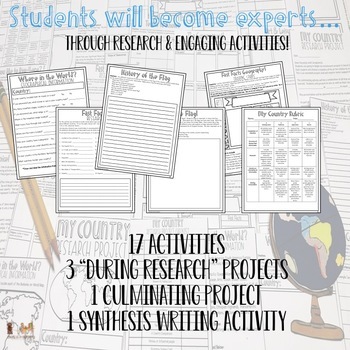 Students will use evidence from their research to support their opinion. Please follow me for future products and sales! Thank you!